Class Charts allows pupils and parents to create their own accounts, so that they can log into the system and view behaviour and homework information that is relevant to them. To begin setting up pupil and parent accounts, click on the three lines menu in the top right hand corner of the page and select School settings from the list of available options. 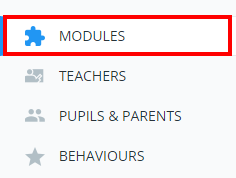 Next, click on the Modules tab. Selecting this option will will display a pupil's behaviour information and homework tasks through the Class Charts account. 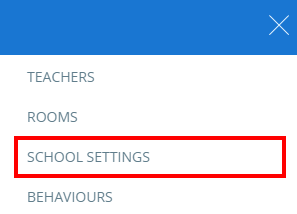 Selecting this option will disable pupil and parent accounts for your school. Selecting this option will only display a pupil's behaviour information through the Class Charts account. Selecting this option will only display a pupil's homework information through the Class Charts account.